My name is Aaron Breza and this is my story. I became a high-fidelity nut at an early age. Still wearing diapers in the early 1980’s I can remember as a child in the living room listening, singing and watching my father, Michael Breza, play records or put in a cassette. At this time in my life my father’s setup included a Sanyo receiver, Dual ULM turntable with a Micro-Acoustics 3002 phono cartridge, Akai tape deck and Advent 2002 speakers. My father’s high school buddy who we called “Lil” Wayland and his father “Big Wayland Lutrell were also audiophiles. “Big” Wayland had a Marantz quadrophonic receiver that was connected to a Phase Linear amplifier, Bose 901 speakers and a Nakamichi Dragon cassette deck. I remember laying on the floor listening to his music, staring at the green Marantz lights as the quadrophonic needles showing where the sound was going. Sometimes, I would sit and wait until one side of the cassette was finished and watched the Nakamichi Dragon automatically open and spin the cassette around and close to play the second side. I was so amused by it all and completely taken by the sound! As I grew, I inherited my father’s old Panasonic quadrophonic receiver, speakers and super tweeters. I had a cheap tape deck and a turntable where I would mimic my father and play music. Then as I turned 17 I bought my first receiver – an Onkyo. Following that, I bought a pair of Paradigm Atom bookshelf speakers and a Paradigm PS 10 subwoofer. When I graduated high school, I left for the Air Force in 1995. Once I was situated on base my father shipped me my stereo system. I remember my friends were always coming by liking how well my system sounded. When I came home from the Air Force, my true endeavors in high fidelity kicked off. 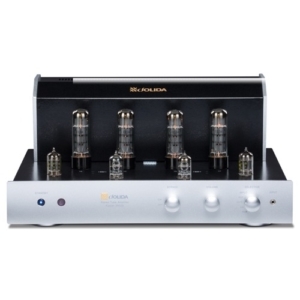 My father had bought a Jolida tube amp and Triangle Titus XL bookshelf speakers and again, I was intrigued by the visual beauty of the glowing tubes and sound. It reminded me of the time my father came to visit me in San Antonio, Texas. We went to a local stereo shop and I fell in love with a small Audio Note amplifier. After hearing my father’s system, I ran out as soon as I could rustle up enough money and bought a used Classe solid state amp. Though it was a huge improvement I still dreamed of the sound of tubes. Then, my father and I met Kevin Deal of Upscale Audio in Upland. After seeing all the tube amps and beautiful speakers Kevin Deal had me hooked. After calling him multiple times (like I still do today) about a price on a Cary SLI-80 F1 Signature tube amp – and after bugging Kevin enough – I finally traded in my Classe for the Cary SLI-80 F1 Signature. A short time later I bought a set of Triangle NIIA speakers from him as well. My father ended up upgrading his speakers to the Gallo 3.1 speakers, Gallo Reference 3 SA bass amp, upgrading the KT- 88’s in the Cary to KT- 120’s, Oppo DV-980H and a Musical Fidelity Tri-Vista 21 DAC. 10 years later I was married and divorced and had to move into my parents’ home as I lost everything. Once I was able to get my feet back on the ground and buy another house, I traded my father my Cary SLI-80 F1 signature amp for his amp and also gave him my Nordost Red Dawn cables and Rotel PC PLC-1040 power generator as a thank you for giving me a place to stay when I was down on my luck. Now for the last three years, I have been back on my feet and back to bugging Kevin Deal! I have been dealing with Kevin for at least 15 years now and he has become family to me and my father. To me, he’s an icon or role model as he has all the “rockin” stuff… cars which I have a passion for, too . Kevin ended up selling me a PrimaLuna Dialogue Premium HP integrated tube amp. I came home and hooked it up to my Triangle speakers – I was in love. I also purchased a PS Audio P10 power regenerator. Just recently, I became fascinated with vinyl again to take me back to an innocent time in my life. After going with my father to T.H.E. Show for the past couple of years, I always caught myself looking/listening for the rooms playing vinyl. This is were my father and I differ as he is more into CD’s and MQA for its ease and lack of crackles and pops from vinyl. But, nevertheless, my goal is to get him hooked. I ended up buying an E.A.T C Sharp turntable with the J0. NO5 Cartridge. I started blowing Kevin’s phone up again – this time for a phono stage. I bought a Manley Chinook SE MKII. The purchase after that one is speakers and I have yet to make my mind up as I have not found ones that turn me on like the Wilson Audio Yvette’s (way out of my league). T.H.E. Show and high-fidelity audio have brought my father and me closer together. It’s a hobby we both love. We love the sound of tubes and like the same when it comes to what we want in the sound of speakers. We like speakers that have great dynamics, imaging and most of all, we like to hear the music coming from the back of the room as if you were at a concert, not up in your face like some speakers. Where we only differ is in vinyl, but I think that will change. Going to T.H.E. Show, visiting Kevin Deal at Upscale Audio or just sitting and listening to music is something I will cherish and take with me till the day I die. 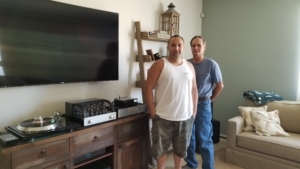 Aaron Breza is a music lover, audiophile, a Air Force Medic Veteran, and all round good guy. He loves his family, especially his puppy, and is a true supporter of great music! You’re a new audiophile … where do you start? Here, of course! Back to the future… or back to the past? Consider for a moment the last time you went to the audio store to purchase a sound system. In the bright, electronic 21st century you are asked to invest in a electronic miracle that sends sound waves throughout the house and office, is linked to your cell phone, and can talk to you in the plane or automobile as you head home. Now look at the smart device that needs a paper legend to figure out what HDMI links to the DVD-Blu-Ray player, television, CD player, radio and home security system. Of course you are in the part of the home that lacks the device legend and you must race about trying to remember what links to what – and if the separate remotes will talk to or ignore each other. Life is so multi-wired and now you are wired as well, but you have no music and the TV is updating but refuses respond to the cable or TV remote. And you fear calling the store again to recap the directions to access your devices. Picture as well the slow, manual early twenties. You know which stereo store had the best in German, Japanese, or American audio equipment. Any store would sell you any device they had in stock, but not necessarily the best buy or the best match for you. Imagine the wonderful six foot tall, two foot wide mega speakers that sounded lush in store and would as well if you lived in there. 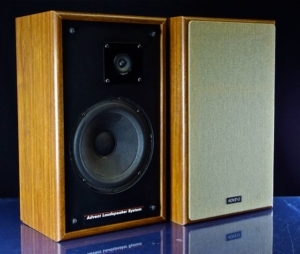 These offered great combinations of incredible audio components were a perfect match if only your living space and bank budget would accommodate the splendor. In the end you can listen to your system in a cramped space and dream of the audio room in the store that wed you to this incredible buy. You can work every component but you can barely enjoy them. Seek out an honest and creative audiophile who can find the best manual machines at the best prices and still afford you both the dream of lush sound synergy to the best components you can readily use and fearlessly manage. It is possible and at a price you can afford. The question this wizard asks, “What is your price point?” and like the magical wizards in Harry Potter tales, he delivers. The sound from these ‘older-fashioned’ components will blow your socks off or detach your toupee; the quality of music will satisfy the most up-to-date audiophiles since it has been proven the older devices are superior in musical clarity and quality over the most excellent CD produced. We are, apparently, back to vinyl and the sound is luscious and gorgeous and you ought really to try it. At this point you will find yourself offered a plethora of devices to peruse and consider….pick any of the following but ask the audiophile historian wizard to show you how he can magic sound just for you. The stereo store of old was the place where you could compare and touch the major and minor players of musical sound systems. The Stereo store was the only source for truly impartial assistance and stocked all likely choices, or opinions biased by what was on hand. Do any of these names sound familiar? The prevailing question in these tight financial times? Can a system be put together for $300-1000.00? Can a grand system be developed and purchased without auctioning your firstborn, pension off a kidney? YES…It can be done with the aid of an audiophile wizard who thinks outside the box, can accept best technologies from any age that marry a great sound and doesn’t break your bank! (2) Non-main steam audio few have heard of—the later seems to be “what’s hot” and expensive in today’s world and it holds its value. The summer of 1974 was hot in Brooklyn, NY – atypical for the East Coast. 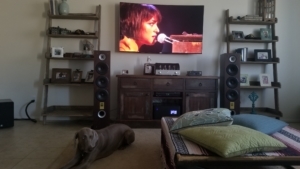 Staying cool in a relative’s house going down in the basement with A/C on and the glow of McIntosh MC 240s, C 22 and four Altec Voice of the theater, a Thorens turntable and Pink Floyd Darkside of the Moon, Carter was hooked. He came home and looked at the all-in-one turntable and Beatles albums his sister let him have. Wow! What could he do? The summer of ’75 in Los Angeles, Carter’s brother-in-law introduced him to the JBL Jubals system and from there they went to Pacific Stereo. The rest is hard work and a lot of cutting grass; detailing cars on the weekends and summers for two years – a top of the line Technics system and every audio rag he could buy. In 1978 Carter moved to Palos Verdes with his family with in the first month he became friends with every Hi Fi store owner in the South Bay. 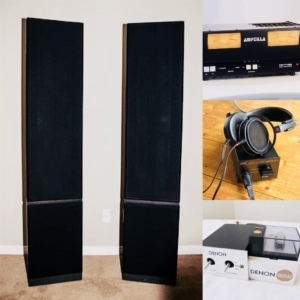 Listening to and building his first Dynaco Pas 3 and his first true audiophile system by the tender age of 19, which brought him to his quest of creating and bring the best sound to each of his clients in the audio world. /wp-content/uploads/2018/02/THESHOW_LOGO_SMALL_PLACEMENT_RGB_COLOR.png 0 0 Emiko Carlin /wp-content/uploads/2018/02/THESHOW_LOGO_SMALL_PLACEMENT_RGB_COLOR.png Emiko Carlin2018-08-21 07:43:192018-08-21 07:43:19You're a new audiophile ... where do you start? Here, of course!